The Circle of Love Afghan tells a love story in the stitches. Moments of clarity, bursts of brightness, a deep ombre of feeling, and an oversized ruffle to share. And it always comes around again, if you stick with it. And it’s just in time for Valentine’s Day! 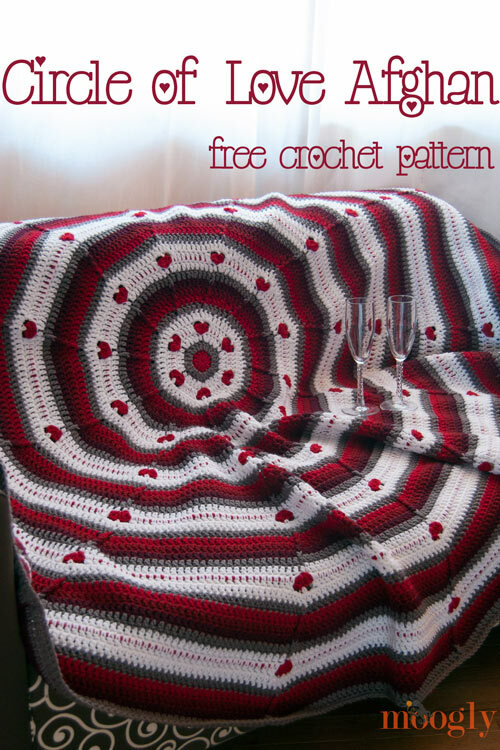 The Circle of Love Afghan is solid, cozy, warm, and fun to make. 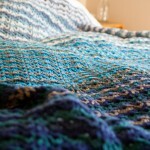 This blanket doesn’t lie down, calm and flat – it’s slightly hyperbolic… or you might say it’s exuberant and generous! The posts stitches point the way, with a gentle curve that always comes back to the heart. The red peeks of color between the hearts create a dashed line that ties it the love together, and while there might be some cloudy gray, it just makes the love all the sweeter! On rounds where you break the yarn and finish off, you can do so using your preferred method, or the Seamless Join (linked above). If you use the Seamless Join, be sure to join to the 2nd st of the round, not the first, to maintain stitch counts. 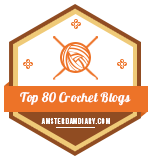 You can join the new color for a new round using a sl st and ch 2 (which does not count as a stitch), and then dc (as written), or you can use the Standing Double Crochet (linked above). When starting a new round with the same color as the previous round (or as in Round 5), you can ch 2 and crochet as written, or you can use the Chainless Starting Double Crochet (linked above) to replace the first dc of the round. No turns! This blanket is worked with a definite right side and wrong side. But don’t worry, the wrong side looks pretty good too. 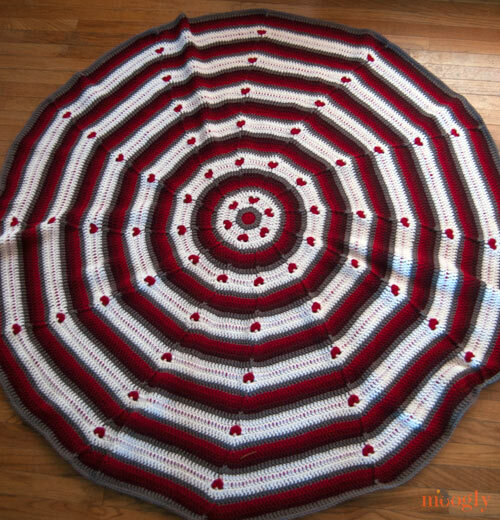 If you wish to make a baby sized blanket, stop after Round 29 and add your border. 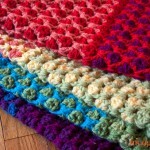 If you wish to make a lap sized blanket, stop after Round 38 or 47, as you prefer. Border/Round 57: Ch 1, sc in each st around. Join with sl st to 1st st and fasten off. (576 sts) Weave in ends. Now cuddle up with someone or something you love! That is just beautiful. Thank you for the pattern! This is soooo going in my ravelry queue 🙂 Thanks so much for sharing, it’s absolutely GORGEOUS! Love the Ombre look with the different shades of red. LOVE! 😀 Thank you so much Angela! 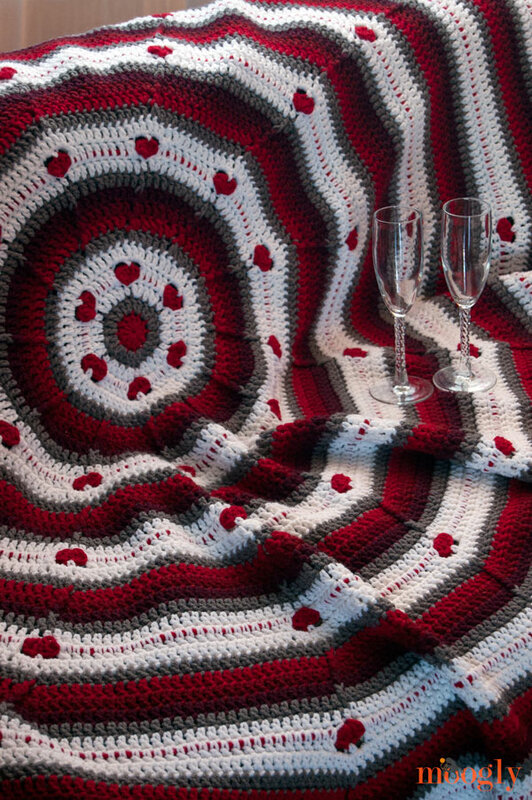 This afghan is sooo beautiful, but much more than I would want to try at this stage of my life. But as I said, it is beautiful. Just beautiful! How do you keep coming up with such creative designs?! Thank you! 😀 Crochet is my passion! I would like to see it when you get it finished. What colors did you use? Opp just went back and seen purple and pink, sorry. Gorgeous. Saving this one to do later. oooo this is so pretty!! I’m going to have to add this to my to-do list for sure! I couldn’t wait to start this but I have a question…on round 7 where it’s supposed to end with 72 stitches, it ends up being 80. I’ve checked and rechecked round 6. I have 60 stitches there. Can you help me to see what I’m missing? I’ve done the 2 dc in one stitch then dc in next 2 and still come up with 80. Thank you! Oh shoot, that was a typo! I’ve corrected it now – that should’ve read dc 4, 2 dc instead. Thanks for letting me know! Thank you. I was having the same problem trying to get to 72. This is beautiful! Trying to talk my husband into an afghan for our bed (he’d prefer a quilt). Seeing this makes me think I need to be more persuasive! 🙂 Thanks for your great patterns! I follow you on facebook and look forward to seeing your posts everyday! 😀 Thanks so much Jamie! This is lovely! I have to make this for my granddaughter. Thank you for sharing it with us! I apologize Laurie, there was a typo on that line. I’ve corrected it now – it should read dc 12, 2 dc in the next. I am in LOVE with this Tamara!!! 😀 Thanks so much Kara! I am confused on row 4. It says to change to color C, which is holly berry but the picture shows you used 3 rows of white? Is there a correction I am not aware of? If you are not suppose to change colors how do you continue on with the same color? Hi Susan! Round 4 is where you make the hearts within the white. You leave the active loop of Round 3 on a stitch marker, and work Round 4 with the red. Then come back to the white from Round 3, replace the loop on the hook, and continue on with the second white row. I hope that helps! On row 15, does it matter where your increase lands? What I mean is are you intending for it to be increased on the sc stitch? Hi Teresa! It does matter a bit, because on Round 16 you use that point to know where to begin, and that’s used to line up Round 17. If you want to put the increase in a different place you can, but you’ll need to keep track of where it would’ve been in the pattern, and it might throw off the post stitch swirl. Thank you so much! I did as the pattern said and it worked out beautifully. I’m very new to reading patterns so sometimes for me it’s reading it a few times even trying to work it a few times till I get it right. Thanks for the response and the pattern, it’s absolutely beautiful and I think after I finish mine (yay a me project) I’m gonna do one in blues with red hearts for my soon to be here grandson! 😀 That’s fantastic to read Teresa! Thank you! I’m so glad. My bad, Tamara! I was miscounting on row 29. But I am still curious as to why this row was not an increase row. Thanks again for a beautiful pattern! Hi Tamara (and co.!!)! I just want to tell you how much I LOVELOVELOVE your patterns and tutorials, particularly the Circle of Love! 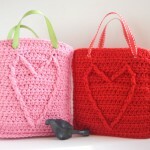 I’ve been able to crochet for 30-odd years, but never learnt how to follow a pattern! Your videos are priceless, IMO! I might be nuts, but I think I’m going to try this one (if I can calculate the yarn quantities in terms of balls, rather than skeins! 😀 Thank you Brigitta! Let me know if you need any help! Hi Brittany! The first stitch of that round is worked in the same stitch that you join to – maybe that’s the confusion? love this pattern, but the hearts aren’t always lining up with the fpdc… i’m well into the pattern – probably about half way now. i figure as the first time i’m trying the pattern there are to be a few errors. i think i get confused about the ch 2 at each beginning row, do you count that as a stitch or is it ok to crochet the first stitch into the same stitch as the join/ch 2? by the way – i think red heart with love is a new favorite yarn! it’s soo soft and my bf hands don’t snag the fibers like they would on other materials. in addition to these colors being incredibly similar to washington state university’s colors, even the bf loves it! no worries, although, this bit of information does help for the next one i’m doing in Seahawks colors!!! 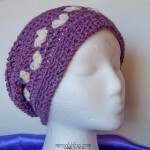 I always figure that when i work a new pattern, there will be errors – a small sacrifice to my yarn muse! I made this and I really enjoyed the pattern, Is there a way to send you a picture of my completed afghan. I used a different color combination than you suggested because it is what I had available. i finally finished the afghan this weekend!!! LOVE it! few things i noticed with the pattern… i think. i’ll let you know if it’s just my brain or if it could benefit other folks as well. 🙂 it’s a gorgeous pattern! Thank you!!! Hermoso, me encanta el diseño. Voy a tratar de hacerlo. I have loved this from the moment you posted it and finally have someone to make it for! My cousin is getting married and I want to make it for a wedding gift. After looking at the With Love color choices I am thinking Lettuce, Clover, and Evergreen should work for the ombre effect in place of the red….would you agree? I really want it to look as beautiful as yours, but his favorite color is green, so I want to “personalize” it for him by making it with his favorite color – your opinion would be much appreciated 🙂 I can’t wait to see the finished project! Thanks so much for the beautiful free pattern!! I think those would be perfect! 😀 Thank you so much Renee! Thanks for your beautiful pattern. I made it for my sister’s 5th Wedding anniversary so I made it with only 5 heart rings. Worked up nicely. Thanks again! Oh what a great gift idea! 😀 Thank you so much Yvonne! Hi 🙂 I was wondering if this could be done in just two colors? I have a lovely dark grey and a lavender color I would like to try it in, but unsure of how I would do it. I am making the Circle of Love Afghan but I ran into a problem at round 15. Round 14 has 156 stitches. Round 15 instructs to doc in each around resulting in 168 stitches. If I’m making one stitch in each of 156 stitches, I end up with 156 stitches. Help! Thank you. I am finishing this now for my room. Changed colors a tad. Was wondering if wanted to do bigger one I should just continue to increase by 2 sts till size need? My daughter wants one to cover her king size bed. SO PRETTY!!! I can’t wait to make this! I’ve been looking for a pattern for my nephew’s Christmas present, and I think I found it! Made without the hearts, because, hello, nephew lol. But he will love the circle pattern! Thank you so much!!! 😀 Thank you so much Pamela! I’m having a time with row 4. I can’t figure out how to surround the heart row with the white. Do you have a video to show how it’s done? I’m afraid I don’t, what part is tripping you up? I love this blanket! I want to make it but I’m afraid it is above my skill level. I couldn’t seem to find the skill level anywhere, am I missing it? I would love some feedback. Thank you! Hi! I love the pattern and just finished the afghan. I had to use regular Red heart instead of ‘with love’ and I chose red, rose pink, soft white baby pink and black. its for valentines day birthday gift for my sister and she loves the black with the red hearts. I think its turned out great and ripples well. On most of the CH 2 stitches at the begining of each row I omitted and started with a double crochet when needed and my count came out fine. this also helped when making the hearts because the first heart of the round (with the CH 2) always looked noticeably bigger to me. Anyway love it so much! thx! 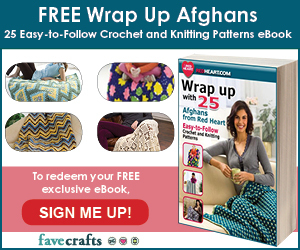 How do I post a pic of my afghan? sry the pinks I used were perfect pink and petal pink. I had some trouble with getting the hearts to sort of line up with the fpdc in rows 3 through 5 but finally conquered it. Now I’m having problems with rows 12 through 14. The hearts do not line at all with the fpdc line. I can make them match, but then row 14 doesn’t work. 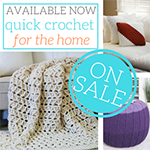 Please help cause I’m going crazy & I’m not a novice crocheter. I have done your stitches to start & stop each round so I am skipping over to the next stitch as well. I can’t really say what the problem is without being there I don’t think. Can you be more specific? 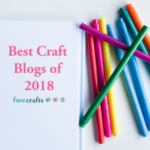 It shoulds like perhaps your fpdc is a stitch too soon? The first 2 sts, including the csdc, would be made in the stitch before the post stitch, as the ch 2 does not count as a stitch. You can absolutely cut it if you prefer! 😀 Whatever works best for you! Do you happen to have a chart?? 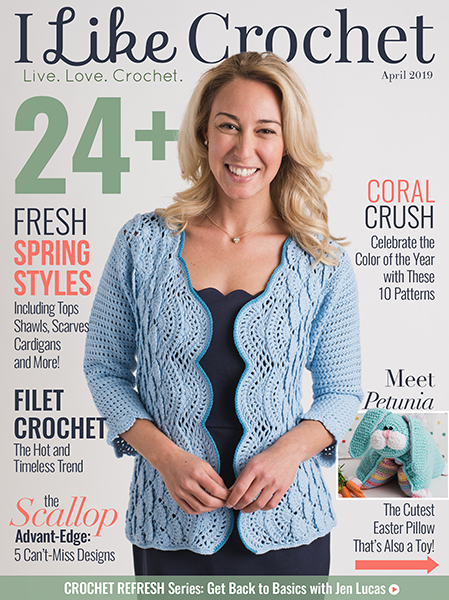 I’m a lefty and I’m thinking like a right handed person but crocheting it left handed ? I’m afraid not for this one – is there a particular part that’s tripping you up that I can help with? 😀 Thank you so much Cheryl!! I’m honored! Another gorgeous project added to my long, long list! I also love your descriptive story to this circle of love piece! Love your work and the passion you give it, Tamara! 😀 Thank you so much Caz! Hi!! I’m almost done with this afghan. I think I have about 13 rounds left for the full size. I was reading the past posts and see that I wasn’t the only one having problems with the fpdc stitches lining up properly. Now, I am a beginner crocheter… And this is my first huge project! I think I’m doing fairly well. I have one section where I somehow have two less stitches than the rest. Starting at row 41 or so, I have lost a stitch in each section between hearts, according to your instructions. However, I am managing to make it work. I think it’s because​ I’m channeling my mom, who LOVED to crochet, and she needed only to look at something and could replicate it with no instructions! I’m really​ loving this piece though and​ would love to send you a pic of my completed product to hear how you think I did! could post a picture, but don’t know how. Hi Michele! 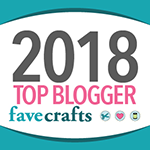 Unfortunately I cannot host photos in comments, but you are welcome to share them on the Moogly Facebook page, or tag me @mooglyblog on Instagram! 🙂 Or shoot me a Ravelry message if you upload photos there! 🙂 I hope you’re enjoying it! Is there a way to download this file so that I can work from a printed copy? I’m a newbie to crocheting but I’m really enjoying working this pattern. My question relates to the hearts. I’m just about ready to start my 3rd round of hearts but I’m noticing the hearts aren’t really taking form. Could it be because I’m making the stitches too tight, too loose, or something else? I don’t know how I missed this until now but I love it! Will have to add to the convince the kids they need this list! The hook size is listed as “J, mm” Quick question, how many mms are in a J hook? Is there a number that should be in that description ?~! Hello. I’m just about to start this project. I wonder if there is a way to print just the pattern without all the ads. Thanks so much for sharing this lovely pattern. I found it! And it is printed. Thanks again for this lovely pattern.